Norwich University’s Golden Anchor Society will host the second-annual Brian Bill Memorial Challenge, a winter military obstacle course race on campus Saturday, Feb. 22. The event, which begins at 9am, is a fundraiser for the Brian R. Bill Memorial Scholarship, which benefits the sons and daughters of US Navy SEALs or those who have served in the US Special Operations Forces. This rugged competition honors the life and sacrifice of Brian Bill, a Norwich Class of 2001 alumnus who graduated with a Bachelor of Science degree in electrical engineering. He went on to become a Navy chief special warfare officer (SEAL). On Aug. 6, 2011, a Chinook helicopter was shot down by enemy fire in Afghanistan, taking the lives of 38 people on board. At 31 years old, Bill was one of 22 SEALs aboard the helicopter. He rests in Arlington National Cemetery alongside many of his teammates who perished in action on that day. The race, which is open to everyone, spans five miles and includes Paine Mountain and more than 20 obstacles and challenges such as the Trident Pass, cargo net, paint ball firing and rope obstacles. Snowshoes are optional. The Golden Anchor Society is a student club dedicated to preserving and passing on Navy traditions. Participants must be 18 or older, and there are 350 spots. 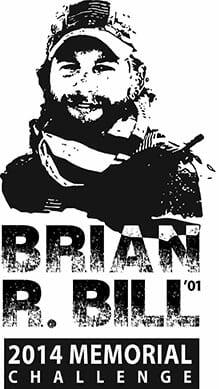 More details are available at the race’s Facebook site, www.facebook.com/BrianBillMemorialChallenge. Registration closes on Friday, Feb. 21, at 8pm. Participants can register as individuals ($50) or as a team ($45/runner). Each participant will receive a commemorative t-shirt and custom memorial dog tag. There will be trophies for the top three finishers in each category. The Brian Bill Memorial Challenge is sponsored by USAA, the b Positive Project, Shale Hill Adventure, and Northfield’s Irish pub and grill, the Knotty Shamrock.